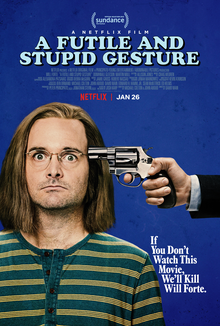 A Futile and Stupid Gesture is an American biographical comedy-drama film, based on Josh Karp's book of the same name, directed by David Wain, and written by Michael Colton and John Aboud. The film stars Will Forte as comedy writer Doug Kenney, during the rise and fall of National Lampoon. The film had its world premiere at the 2018 Sundance Film Festival on January 24, and was released on Netflix on January 26, 2018. The film's timeline stretches from 1964 to 1980. The film opens with Doug Kenney and his classmate Henry Beard celebrating the release of their book, Bored of the Rings, with the Harvard Lampoon staff. The two men graduate from Harvard and Kenney convinces Beard not to go to law school but instead publish a monthly magazine known as the National Lampoon. Though Doug Kenney is the magazine's main creative voice, there would be no magazine without the guidance of Beard. Doug Kenney becomes the comedy writer and Henry Beard the business manager, while the magazine also has a thriving art department. The two men get financing from Matty Simmons. All of the writers work hard to be funny and meet deadlines. Work is a party atmosphere and drugs add to the creative process. The magazine is not initially a success until lawsuits are threatened by Disney, Volkswagen, Mormons, and many other established names. The comedy world is changed, and the magazine pushes the acceptance of satire and parody with each edition. Burnout is common and Kenney suddenly leaves for nine months with a one line note to Henry. The magazine stays successful under Beard. After five years Simmons agrees to a buyout and the two men each collect $3.5 million. National Lampoon expands to an hour radio show attracting more great comedians like Gilda Radner, Chevy Chase, and Bill Murray. Special editions of the magazine are published such as one mocking high school yearbooks. Doug Kenney then moves to movies and writes Animal House starring John Belushi in 1978. With the success of the film, cocaine takes over Kenney's life. As ongoing disputes with studio executives continue, Kenney writes Caddyshack. He does not like his work and embarrasses himself drunk and high at a press conference promoting the film. Chevy Chase takes Kenney to Hawaii to beat cocaine, but cocaine wins instead. In 1980, at age 33, Douglas Kenney's body is found at the bottom of a Hawaiian cliff. As he has narrated his life's story through the movie, Doug is displeased to see everyone sad at his funeral. The movie ends with Beard starting a food fight at his wake. Principal photography began in Los Angeles, California on April 14, 2016. A single trailer was released on December 20, 2017. The film had its world premiere at the 2018 Sundance Film Festival on January 24, and was then released on Netflix on January 26, 2018. On Rotten Tomatoes, the film has an approval rating of 64%, based on 39 reviews, with an average rating of 6.4/10. On Metacritic, the film has a score of 55 out of 100, based on 14 critics, indicating "mixed or average reviews". Writing for TheWrap, Todd Gilchrist opined, "Even if the casting choices in portraying some of iconic talents in Kenney’s orbit are occasionally questionable — a detail the film gleefully acknowledges — there’s something delightful about watching actors known for comedy now try to capture the sound or energy of the performers who inspired them." Ellin Stein of Slate stated, "There's a sense that the filmmakers have bitten off more than they can chew by trying to cram both the biography and the panoramic overview into one feature." ^ Debruge, Peter (2017-11-29). "Sundance Film Festival Unveils Full 2018 Features Lineup". Variety. Retrieved 2017-11-29. ^ "January premieres on Netflix". Screencrush. Retrieved 2017-12-13. ^ "Will Forte Creates National Lampoon in First 'A Futile and Stupid Gesture' Trailer". Collider. 2017-12-20. Retrieved 2017-12-23. ^ Siegel, Tatiana (April 14, 2016). "Netflix Rounds Out Cast of National Lampoon Movie 'A Futile & Stupid Gesture'". The Hollywood Reporter. Retrieved June 22, 2016. ^ "Netflix's A Futile & Stupid Gesture Starts Principal Photography Today". Netflix. April 14, 2016. Retrieved June 22, 2016. ^ Ramos, Dino-Ray (2017-12-20). "'A Futile And Stupid Gesture' Trailer: Will Forte Creates National Lampoon In Netflix Comedy". Deadspin. Retrieved 2018-02-01. ^ "A Futile and Stupid Gesture (2017)". Retrieved 2018-02-22. ^ "A Futile and Stupid Gesture Reviews". Retrieved 2018-02-01. ^ Gilchrist, Todd (2018-01-24). "'A Futile and Stupid Gesture' Film Review: National Lampoon Biopic Gently Celebrates Anarchy". The Wrap. Retrieved 2018-02-01. ^ Stein, Ellin (2018-01-26). "A Futile and Stupid Gesture Fails to Capture the Spirit of the National Lampoon". Slate Magazine. Retrieved 2018-02-01. This page was last edited on 19 April 2019, at 11:52 (UTC).